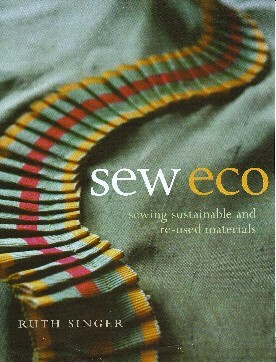 Ruth’s second book explores sustainable sewing in considerable detail and resulted from a lot of research to find sustainable fabrics for use in Ruth’s own collections. The first half of the book explores textiles and the environment, discussing some of the issues of chemical use in fabric production, and then looks at how we can make greener choices by shopping locally, using organic fabrics and choosing upcycled fabrics before new ones. Ruth also looks at how to improve the carbon footprint of your whole sewing practice and covers interfacing, wadding, stuffing, dyes and washing fabrics. A chapter on buying vintage fabrics gives you practical advice on where to source beautiful and sustainable fabrics, as well as tips on cleaning, storage and knowing what to preserve and what to cut up.